= Nee mite! Maggie Sensei nenagara shigoto wo shiteiruyo. = Hey, look! 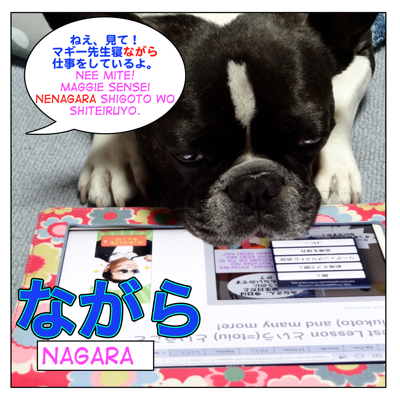 Maggie Sensei is working while sleeping! 1) While doing something, to do two actions at the same time. Now you just add what you are going do while doing something. =Itsumo gohan wo tabenagara terebi wo miru. =I always eat watching TV. = Arukinagara tabako wo sutte wa ikemasen. = Don’t smoke while walking. = Kodomotachi wa warainagara geimu de asonde ita. = The children were playing a game laughing. = Kanojo no koto wo kangaenagara ichinichi wo sugosu. = To spend a day thinking about her. = Nihon ni inagara furansugo no rajio bangumi ga kikeru. = Even (while living) in Japan, we can listen to the radio program in French. = Kare no kimochi wo shirinagara mushi wo shiteiru. = I know how he feels about me but I have been ignoring him. = Kanojo wa nihongo nante kiraida to iinagara mo ganbatte benkyou shiteiru. = She said she didn’t like Japanese but she still has been studying very hard. = Watashi no koto wo sukitte itte okinagara hoka no ko to deito wo surunante! = How dare him to date someone else even though he said he likes me. = Anna koto wo shite okinagara yoku sonna koto ga ierune. = How dare you to say things like that after you did such a thing. = Watashi ga sasotte okinagara issho ni ikenakute gomennasai. You can use it with a noun or an adjective. = Kodomo nagara ni iroirona koto wo yoku shitteiru. = Even while being a child, he knows a lot. = Maggie wa motto gohan wo kudasai to namidanagara ni uttaeta. = Maggie asked me to feed her more tearfully. = Kono hoteru wa chiisai nagara setsubi ga ii. = This hotel is small but it is fully equipped. = Kare wa mazushii nagaramo shiawase naseikatsu. = He was poor but (Even while being poor) he was having a happy life. = Zannen nagara nihon ni ikemasen. = Unfortunately I can’t go to Japan. = Kono hen wa mukashinagara no omise ga ooi. = There are many traditional stores around here. = Kare wa umarenagara ni hito wo minuku sainou wo motte iru. = He is gifted to see through people. = Kore kara ippai ressun wo tsukurimasu. Mainichi kono saito ni kite kudasaine. = I will make a lot of lessons from now so please come visit this site everyday. = Tabenagara benkyou shite mo daijyoubu desu. = You can study eating something. question why is it ni? when ever i think i kno a particletheres these sentences that mess me up. can you ex plain why? There is something I don’t understand – using TE IKEMASEN with NAGARA – because I have seen examples of this in both ways and can’t be sure which one is better. Example 1. Arukinagara tabako wo sutte wa ikemasen. Example 2. Terebi wo minagara, benkyou shinai de kudasai. Example 3. Toshokan de, ongaku wo kikinagara, benkyou shinai de kudasai. Why?? Why is it not ‘Benkyou shinagara, terebi o minaide kudasai’ (and same for example 3)?? Because it’s the first part of the sentence what’s not allowed. Do not study watching TV. = terebi o minagara benkyou shite wa ikemasen. = Terebi o minagara benkou shinai de kudasai. Q* Because it’s the first part of the sentence what’s not allowed. “to study watching TV” = テレビを観ながら勉強する = terebi o minagara benkyou suru. Of course the main action is “to study” and the speaker wants to say not to study in certain condition. = Benkyou shinagara terebi o minai de kudasai. The main action is テレビを観る, watching TV. So it means “Do not watch TV while you are studying.” and it changes the nuance. 恥ずかしながら　is an expression but it doesn’t follow the rule with i-adjective. It is probably you deal it as a noun 恥ずかしいこと→恥ずかし in this case. Gohan o tabe nagara terebi o Mimasu..Can we say it – I am having food while watching TV. Or I am watching Tv while having food. Is it one and the same thing? If I am not right. Can you please explain.. I recently got handed down a katana that came from Japan during ww2. I do not have social media but I was wandering if I could get your email and send you a picture of the kanji and you could possibly translate it thanks! Sorry. I don’t use email to accept questions or do translation. If you tentatively make a Twitter account send me a picture. Usually they use an old writing style in katana. If so I don’t think I can read it. You have to ask an expert. My friend told me that nagara is added to masu form to say “while doing,” instead of changing to nai and then removing it. Don’t these two examples show pre masu form + nagara instead of nai–> remove nai–>add nagara? Thank you!! I fixed the pattern. I must have copied and pasted the line 寝ながら….